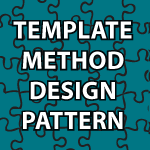 Welcome to my Template Method Design Pattern Tutorial. It is an extremely easy design pattern to understand and use. With this pattern, you define a method (algorithm) in an abstract class. It contains both abstract methods and non-abstract methods. The subclasses that extend this abstract class then override those methods that don’t make sense for them to use in the default way. It may sound complicated, but it definitely isn’t. It is also extremely useful. Look at the code after the video to get a complete understanding quickly. Please can you make a video series dedicated to Java FX 2.2 ? EX: How to create an program that stores phone models(every model with their picture) inside a database. And pack the app inside a jar or installer for distribution. Thank you 🙂 I wish I would have used UML but at the time I made a judgement call to not require people to understand UML to follow along. I then made a UML tutorial if that may help. Thank you 🙂 I’m just happy that the videos are helping. I don’t require anything else.